If you are planning on reconstructing or undertaking home improvement projects on your property, it is important to rent a dumpster that will accommodate all the garbage, wood waste and other debris. Piling the additional garbage in your backyard is not just unsanitary but also an eyesore. Instead of letting waste materials deface your property, you can invest in temporary dumpsters at affordable prices and dispose off the debris in a safe and legal manner. While many companies are used to hiring dumpsters when necessary, homeowners are not. If you have never hired a large dumpster from a local company before, these tips can help you make the choice. Most firms offer renting a dumpster deal with companies. When homeowners are not aware of the proper terminology, they can get impatient. While they are known as dumpsters in layman terms, it is best to refer to them as roll-off or containers that carry waste. All containers are available in standard sizes that are measured in yards. Instead of calling their sizes as cubic yards, you can simply refer to them as yards or yarders. For example, if you are renting a dumpster with a volume of 20 cubic yards, you can simply call it a twenty yarder. While most dumpsters are not large enough to cause any disruption, it is important to clear the matter with the local authorities. Your building permit office or parking enforcement office can give you all necessary details on where you can place the rented container without affecting your neighbors. You may not face issues if the container is being placed within your property. However if the dumpster is too large for your property, you may have to place it on the street and take care of storage, safety and cleaning up. Consult with and inform your neighborhood association of your intended activities and seek permission to place these large containers outside your property. If the local authority board does not allow this, you may risk fines and other penalties. While placing the dumpster in the right place is an important decision you must make, you should consider how the dumpster will be transported. A large container is usually dropped off in a truck. This means that you must prepare your property and clear out space to allow the truck to transport and drop the container in place. If you want the container to be positioned a certain way, ensure that you have cleared the space and spoken to the company about it beforehand. More often than not, container deliveries are done during the day and if you are at work when the truck driver faces trouble in your home, you could end up wasting time. In some cases, rental companies also charge an additional fee if the delivery required additional work. Alternatively, you could experience a delay if the delivery was unsuccessful. Ensure that you have cleared out enough space for the truck to back up and deliver the waste disposal dumpster. 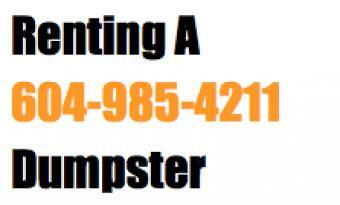 Watch our renting a dumpster bin rental service in Vancouver Video. Renting a dumpster in Vancouver.